I was thinking about this weblog today, and how I have not published anything for quite a while... since July, it turns out. I was thinking about whether I should just delete it, abandon it and continue to let it grow stale, or try to get back to posting once in a while. I guess since I'm posting this, I've decided on the latter option, but we'll have to see how long that lasts. I'm just not much of a writer, and, for the most part, I don't really feel I have anything interesting to say... at least in words. I hope my photographs continue to speak to the world in at least some minor way. So I have a photograph to post, one that I hope is the first of many more, and there's a story about how I came to shoot it, which I'm going to try to relate here in a comprehensible way. As you can see, it's a couple of people working on a couple of cranes. They're using one crane to help in the deconstruction of the other, which was something I found fascinating to watch and to photograph. In my day job, I work for a major healthcare organization, one that owns and manages several hospitals. We're building a new tower at the hospital across the street from the building in which I work. Every day I go for a lunch time walk, and I like to watch what's going on with the construction. For most of the construction period, there have been two large, fixed cranes in use to raise or lower whatever needs to be raised or lowered. One of the two was removed a few weeks ago. I had hoped to watch because I really wanted to know how it was done. Unfortunately when I arrived on a Saturday morning on site, the interesting part of the job was already complete. When I noticed that the removal of the second crane seemed imminent, I started keeping a close eye on the proceedings. Last Friday afternoon I noticed that the cable that runs through the giant pulley had been removed. 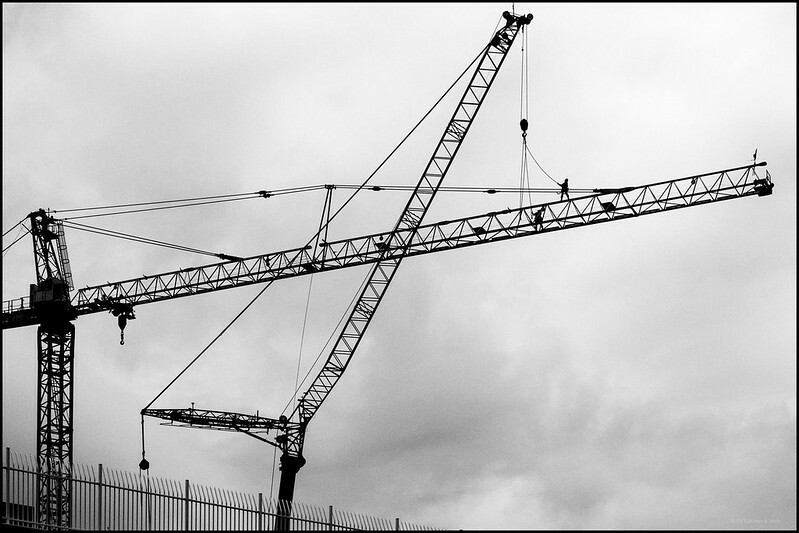 During my walk I saw that a large, mobile crane had been brought in and was being assembled. So I correctly figured Saturday was the day, and I decided that this time I wasn't going to miss it. I arrived at about 8:00 AM and was relieved to see that the deconstruction hadn't yet started. The mobile crane was set up and was in the process of being extended to its working height. I didn't have to wait long before four men climbed up the fixed crane and started to work. They first removed most of the counterweights on the back end of the boom. Then two of them walked out the front end of the boom and climbed into position to grab the lifting cables of the mobile crane. During that process is when I shot this photo. After making this photo I continued to watch until the workers had removed and lowered the first section of the boom. At that time I decided I had seen enough, that I had the photos I wanted, and that it was time for lunch.